Links in the post below include affiliate links for MamaBreak. What a fantastic time for new savings on Blurb. We like to order early for relatives we will only see on Thanksgiving and not Christmas! Do you love the idea of scrapbooking, but sick of manually cutting out items and gluing them? 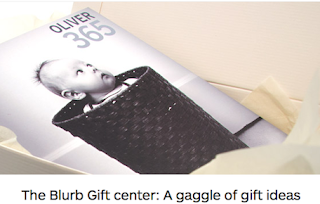 Before you start having visions of gluing and sewing together pages, check out the Blurb Gift Center. Blurb helps you to make amazing photo books using their free tools. Just add photos and text, choose your options (like paper and cover type), and then order. Lost as to what to create? That is where the Blurb Gift Center comes in---to give you lots of ideas. Want to make a book about your family? Try the Blurb Family History Book. Have a new baby? Try a Blurb Baby Book! Want to share your personal recipes? How about a Blurb Food Book.This holiday season, make your gift recipients feel really special by making them something special. There really is a book for everyone. When you use the coupon code: EARLYSAVINGS **Offer valid through November 11, 2013 (11:59 p.m. local time). Valid for printed books only. A $25 discount is applied toward your product total with a minimum order of $100. This offer is good for one-time use, and cannot be combined with volume discounts, other promotional codes, gift cards, or used for adjustments on previous orders. The post above contains affiliate links for MamaBreak! We thank you for supporting us! We never post any information or content that we do not think our readers will enjoy!